If my well-worn copy of The Flavor Bible is any indication, I’m constantly searching for the perfect culinary match. But no matter how many unique pairings that I try, I always end up craving those good old comfort food combinations, like cinnamon and oats or vanilla and cashews. So when I was asked by Silk to share a Perfect Match with their new Cashewmilk, I decided to skip the fancy searches and headed straight to my pantry to whip up a fun recipe that I’d been wanting to try for ages: Cinnamon Roll Overnight Oatmeal. Though it might somehow sound elaborate, cinnamon roll overnight oatmeal is SO easy, and can be enjoyed cool, warmed or hot (that swirl will even get a little melty!) – your choice. The oats require just a minute of prep, the swirl and optional icing can be whipped up during NCIS or Gotham commercials (yes, I like my primetime TV), and all can be made ahead and stored to enjoy over a few breakfasts. And it should be noted that this cinnamon roll overnight oatmeal is a perfect match, in my opinion, for so many reasons. The delicious flavor for starters, but it’s also become my new favorite for a wholesome breakfast. My day starts off busy with work, but slow from a physical perspective. Lots of computer tasks, editing and the constant temptation of the kitchen. I need something energizing but totally fulfilling so that I’m not enticed to constantly nosh. Forget the “high protein satiates” claim – my body wants some good carbs in the a.m. This cinnamon roll overnight oatmeal not only fits that bill, it’s also ready for me right from the refrigerator, so I can dive right into breakfast and my day. For the oatmeal base, I bought a half-gallon of the Original Silk Cashewmilk at a local grocer to try out. I waffled between this one and the Unsweetened, but as it turned out, the Original offers the perfect hint of sweetness (just 7 grams of sugars per cup), and a good-size dose of calcium, vitamin D, vitamin E and B vitamins (including B12). And yes, it’s dairy-free, vegan, soy-free, carrageenan-free, and even non-GMO verified. But what intrigued me most was their secret creamy addition: almond butter. I had thought cashews were creamy enough on their own, but can’t argue with the pleasant favor that a touch of almond adds to Silk Cashewmilk. Curious? You can find out where to buy the dairy-free Silk Cashewmilk, or any of their other milk beverages, using the Silk store locator. Oh, and my piping skills may not be pretty, but the optional dairy-free cream cheese icing – just a touch needed – adds a little something extra. It isn’t required, but it is tasty! ❤ this recipe!! I double the recipe and make it last a few days! – Samantha M.
By ingredients, this recipe is dairy-free / non-dairy, egg-free, optionally gluten-free, peanut-free, soy-free, vegan / plant-based, and vegetarian. For nut-free, you can substitute 1/4 cup of sunflower seed butter for the cashews (soy butter, pea butter or another seed butter would likely work, too), and use a “safe” milk beverage for your needs. 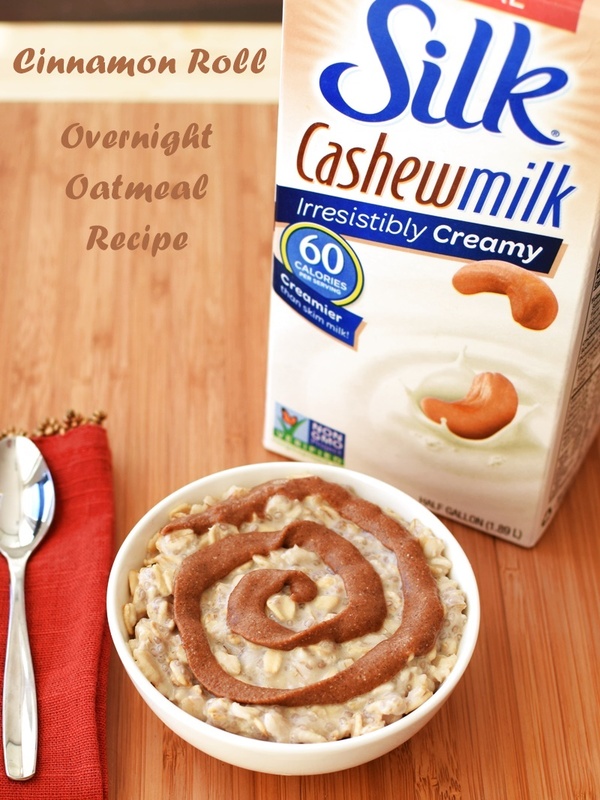 I created this cinnamon roll overnight oatmeal recipe for the Silk Perfect Match campaign, and to trial their new dairy-free Cashewmilk. For more recipes, giveaways and an instant product coupon, sign up for the Silk newlsetter. Though this recipe does serve four, the overnight oatmeal and the cinnamon roll swirl will keep for a few days. So you could also enjoy it as a make-ahead recipe for one or two, over more than one morning! Combine the oats, milk beverage, and chia seeds in a large bowl. Cover and chill several hours or overnight. Place the cashew pieces and coconut sugar (if using) in your spice grinder or small food processor, and whiz until finely ground and beginning to clump, about 1 minute. Put the cashews and sugar (add the brown sugar now, if using) in a medium bowl along with the coconut oil, cinnamon, vanilla, salt, and stevia (if using). Stir until thoroughly combined into a paste. Place in a small zippered plastic bag, seal the top, and snip off a small piece of a bottom corn of the bag. It can be used immediately or made ahead with the oats. If you opt to chill it, briefly reheat to re-soften. Divide the oats between 4 dishes, and optionally heat briefly in the microwave (or in a pan on the stove). 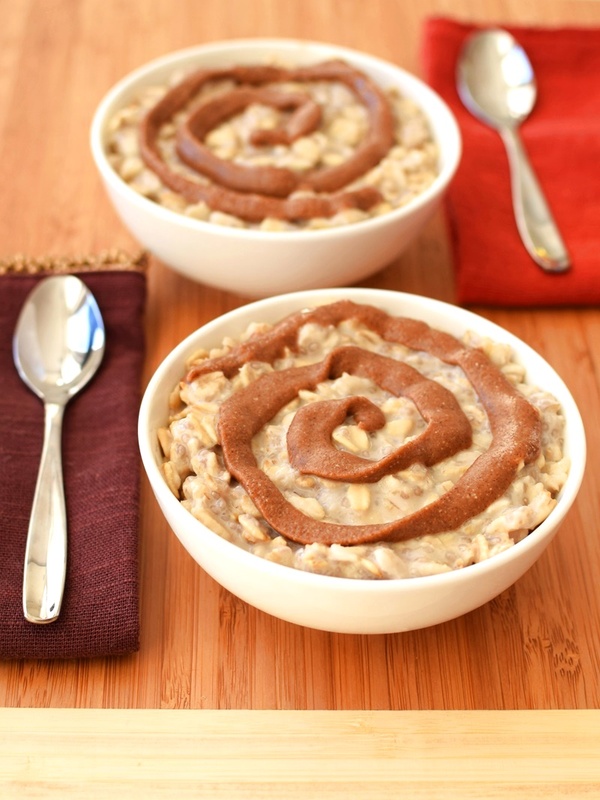 Squeeze the cinnamon-cashew mixture over the oatmeal bowls in a swirled fashion. If desired, combine the cheesy icing ingredients, and pipe or dollop over the oatmeal. I haven’t tried Silk cashew milk yet but love their other varieties. This oatmeal looks and sounds like the perfect breakfast! I think it is 🙂 Thanks Joanie! You got me with that swirl! I want it! This looks so great! And a perfect school-morning breakfast. Is it possible to make it without chia seeds? I have all the other ingredients on hand! Yes! I would reduce the liquid to about 1/2 cup if you want all of the liquid to be absorbed. That said, I have to admit I like the overnight oats better with chia – a little creamier I think. I love oatmeal in the morning – and it’s funny, I usually make it with water, but today I used coconut milk! I will have to try this recipe next! Love the Silk cashew milk, and wow this oatmeal looks scrumptious! These overnight oats sounds so delicious! Love the flavors! Thank you Sharon – we love them, too! I love The Flavor Bible too! And this oatmeal looks absolutely amazing! I know, that book is addicting, isn’t it? This looks delicious and I could go a bowlful now. Or ten. Oh goodie – I can’t wait to see your recipe! Holy Moly, that just looks WAY TOO GOOD to be true!!! And I am loving all the dairy-free milk options these days! I wonder what this universe is going to MILK NEXT?! LOL! I just had tigernut milk recently – quite excellent, too! 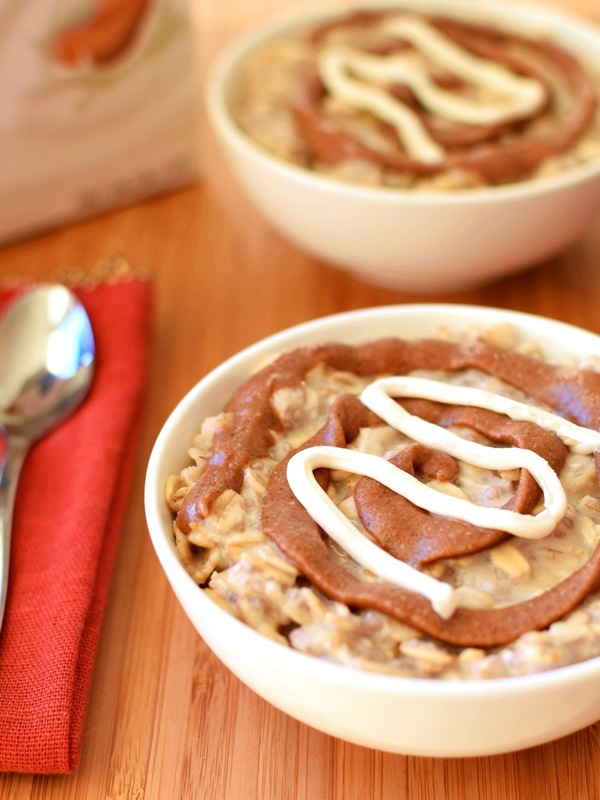 I already love overnight oats, but add cinnamon roll to the mix? I gotta try this! I’m looking forward to trying out this cashew milk too! If you like overnight oats, then you will love this twist Stephanie! So I just got on the overnight oatmeal bandwagon this week lol I made overnight oats in a PB jar and it was delicious. I’ll have to try this for sure. I have yet to try cashew milk but I hear it’s even better than almond milk? I think I do like it better than almond milk – but it depends on what it’s for – definitely creamier and a little less “nutty” than almond milk. I’m like you – I tried overnight oats years ago and really didn’t like them. Decided to give it another go with different ratios and spiked with chia and hit the jackpot for my tastes! That is so pretty, Alisa! And, it sounds delicious, too. And this is why your food looks like it could be on a package and mine looks like something you shouldn’t eat 🙂 I LOVE the idea and the presentation ,i so need to take the time to do those things and enjoy the meal even more. It’s pretty new Liz, so don’t fret! It wasn’t at my local coop last week, and this week is just appeared! It seems to be just rolling out to stores that carry other Silk products now.